Proportioning / Combo Valves. Special Order Custom Builds. Mopar B & E Body. Mopar A Body 5×4.5. Mopar A Body 5×4. Disc/ Disc Disc/ Drum. 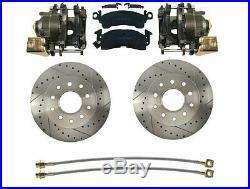 Ford 9 High Performance Rear Disc Brake Conversion Kit , DBK9LX. The DBK9LX provides an easy to install, bolt on solution for upgrading your pre-1980 Ford passenger car 9 rear-end to disc brake performance. Our kit is unique in that it provides all the brackets and flanges that fit the three most popular sizes of the small bearing 9 rear end. Will fit 8.8″ – 9″ Rear Ends! Does not work with 14 rims. 15 or larger needed with the kit. 3-3/8 x 2 3-1/2 x 2-3/8 3-9/16 x 2 This eliminates all guesswork when purchasing and installing the kit and makes what we call a Universal kit! If you have any questions feel free to send us a message, and also check out the axle flange measurements below for compatibility. 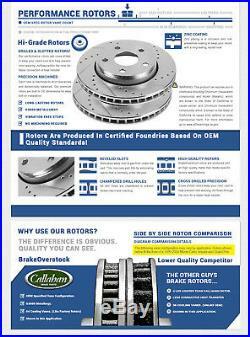 Rotors are 11.5” O. 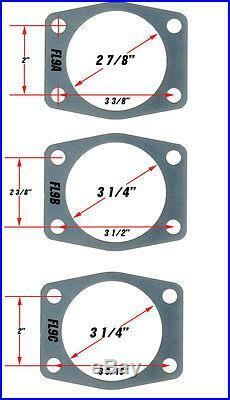 With 2.8” Hub I. Drilled for Ford 5 x 4.5” w/ 1/2” studs & GM 5 x 4.75” w/ 7/16” stud bolt patterns. Calipers have the emergency brake built in E-brake kit. 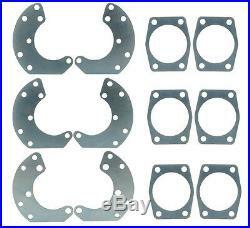 Hardware & Brackets for all 3 of the most popular 9 Ford Rear Ends. WILL NOT work with Moser, Currie, or Aftermarket axles. NOTE You will need a larger bore master cylinder and a disc/disc proportioning valve when swapping out your rear drums to disc brakes. ALL OF THE PARTS ARE BRAND NEW PARTS! NOTHING REBUILT OR RE-MAN! 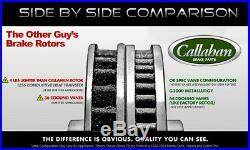 NOT FOR USE WITH FORD BRONCOS/TRUCKS or LINCOLNS WITH LARGE BEARING REAR ENDS! Ford Falcon (North America). Tech Support included in EVERY sale! Pirate Jack Hot Rod Restoration is your one-stop-shop for quality disc brake conversions, brake boosters, master cylinders, and proportioning valves. We specialize in performance brakes for late fullsize GM cars from 1955-70 and muscle cars from 1962-74, Mopar, Chevy, & Ford. Pirate Jack also carries a full line of parts for Street Rods & Custom Built cars, including pedal assemblies, and hard to find power boosters, GM Restoration Parts, disc brake kits, and suspension products. Check out our tech page for information like how to test a brake booster, how to hook up a proportioning valve, how to plumb my brake lines, how to test my master cylinder and a F. Q’s on how to calculate pedal ratio. We offer FREE tech support on all our disc brake kits and booster conversion kits to take the guess work out of your job. Pirate Jack offers how to guides and instructional videos on our video page. We strive to give you 100% satisfaction and we sincerely want to help you stop your vehicle and install our kits safely. We want your restoration to be easy! We also have some instructional video’s and other helpful support you may need. We give limited support on weekends and are available M-F 7:30-4:30 EST. Your order will be professionally and durably packed for its time in transit to you so we can give you the very best. In addition, you will receive a packing slip to check over your order. Add to Favorite Sellers. Sign up to Newsletter. View more great items. This listing is currently undergoing maintenance, we apologise for any inconvenience caused. 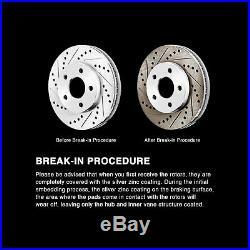 The item “Ford 9 Rear Disc Brake Kit Drilled/ Slotted Rotors Emergency Brake Calipers” is in sale since Thursday, January 15, 2015. 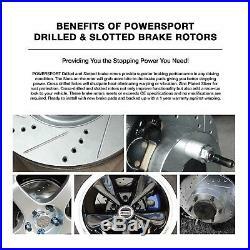 This item is in the category “eBay Motors\Parts & Accessories\Car & Truck Parts\Brakes & Brake Parts\Discs, Rotors & Hardware”. The seller is “pirate-jack-asheville-nc” and is located in Asheville, North Carolina. 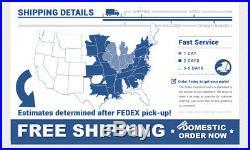 This item can be shipped to North, South, or Latin America, United Kingdom, Denmark, Romania, Slovakia, Bulgaria, Czech republic, Finland, Hungary, Latvia, Lithuania, Malta, Estonia, Australia, Greece, Portugal, Cyprus, Slovenia, Japan, China, Sweden, South Korea, Indonesia, Taiwan, South africa, Thailand, Belgium, France, Hong Kong, Ireland, Netherlands, Poland, Spain, Italy, Germany, Austria, New Zealand, Philippines, Singapore, Switzerland, Norway, Saudi arabia, Ukraine, United arab emirates, Qatar, Kuwait, Bahrain, Croatia, Malaysia, Bangladesh, Brunei darussalam, Egypt, Iceland, Jordan, Cambodia, Sri lanka, Luxembourg, Monaco, Maldives, Oman, Pakistan, Reunion, Viet nam. Rim Size: MUST have 15″ or larger rims. Ford F150 2004 – 2011 Fits 6 Lug Models Ford F150 Raptor 4WD 2010 – 2011 Lincoln Mark LT 2006 – 2008 6 Lug Models ONLY. 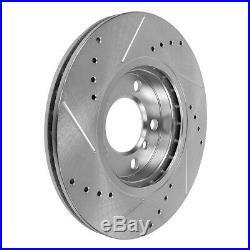 The item “Rear Drill Slot Brake Rotors And Ceramic Pads For Ford F150 Lincoln Mark Lt” is in sale since Monday, April 27, 2015. This item is in the category “eBay Motors\Parts & Accessories\Car & Truck Parts\Brakes & Brake Parts\Brake Component Packages”. 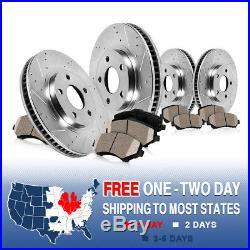 The seller is “brake_overstock” and is located in Orland Park, Illinois. This item can be shipped to United States, Canada, United Kingdom, Denmark, Romania, Slovakia, Bulgaria, Czech republic, Finland, Hungary, Latvia, Lithuania, Malta, Estonia, Australia, Greece, Portugal, Cyprus, Slovenia, Japan, China, Sweden, South Korea, Indonesia, Taiwan, South africa, Thailand, Belgium, France, Hong Kong, Ireland, Netherlands, Poland, Spain, Italy, Germany, Austria, Bahamas, Mexico, New Zealand, Philippines, Singapore, Switzerland, Norway, Saudi arabia, Ukraine, United arab emirates, Qatar, Kuwait, Bahrain, Croatia, Malaysia, Brazil, Chile, Colombia, Costa rica, Dominican republic, Panama, Trinidad and tobago, Guatemala, El salvador, Honduras, Jamaica, Antigua and barbuda, Aruba, Belize, Dominica, Grenada, Saint kitts and nevis, Saint lucia, Montserrat, Turks and caicos islands, Barbados, Brunei darussalam, Bolivia, Ecuador, Egypt, Guadeloupe, Iceland, Jordan, Cambodia, Cayman islands, Liechtenstein, Sri lanka, Maldives, Nicaragua, Oman, Peru, Pakistan, Paraguay, Reunion, Viet nam, Uruguay. Fitment based on U. 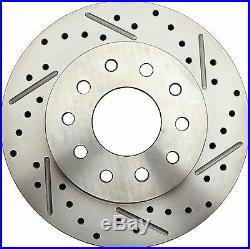 Front & Rear POWERSPORT Cross-Drilled & Slotted Brake Rotors. 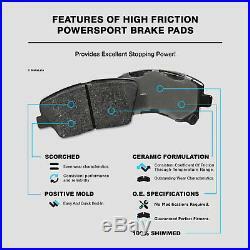 Front & Rear POWERSPORT Ceramic Brake Pads. ACTUAL PRODUCT MAY VARY FROM PHOTO. I didn’t expect my order to be here right away after placing it. Prices are good, parts fit perfect. I’ll recommend it to everybody I’ll rate them six stars! Consistent Coefficient Of Friction Through Temperature Range. Consistent performance and reliablitly. Easy And Quick Bed-In. My new brake pads are outstanding. I can feel the difference on the bite with the new pads. Orders placed after 5 p. Were Here to Help. Customer Service is Available. Will this fit on my vehicle? What are the dimensions? All images shown are sample pictures. No modifications needed to install the brakes. What coating do the rotors have? 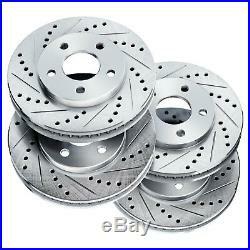 Only our drilled/slotted brake rotors will come with zinc plating. 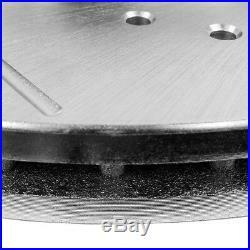 The OE style non drilled or slotted rotors do not come with zinc plating. The zinc plating on the braking surface of the drilled/slotted rotors (area where the brake pads contact when you brake) will come off during braking. The braking surface, the cross drills holes and/or slots if applicable can develop surface rust over time, depending on weather, climate, driving conditions, or left parked for days. Zinc plating will help against rust but not prevent rust indefinitely. Are the rotors and pads images the actual items I will receive? All images are for display purposes. Actual items can vary due to fitment specification. We advise you to never confirm your fitment base on images. Where is my item? The packaging I received does not look like the image online? Actual packaging may vary from image. All return item(s) must be unused and brand new in its original box. The report must include exact details, measurements, symptoms that prove the rotor or rotors to be warped along with any associated test results. Brake Labs is not responsible for any outside cost. 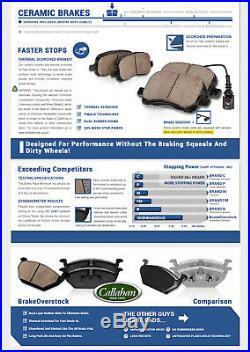 Modern brakes pads are formulated to minimize noise but due to its nature, there is never any guarantee against squealing. 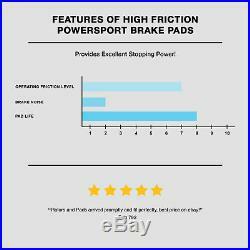 Even if you use the same pads on two identical vehicles, one can experience squeaking and the other may not. Brake pad noise does not mean the pads are bad or defective. There are many variables when it comes to noise with brake pads and its occurrence can be completely random. 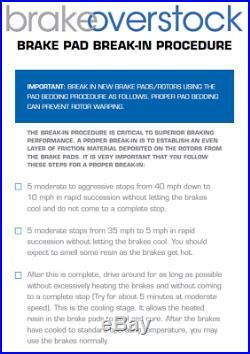 Here at Brake Labs we make it easy for consumers to meet their braking needs without any modifications to their factory system. 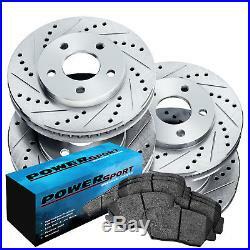 Our goal is to provide the best braking power for any driving style and driving conditions. 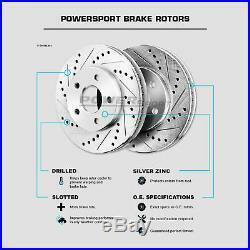 The item “Fit 2012 Ford F-150 Front Rear PSport Drill Slot Brake Rotors+Ceramic Brake Pads” is in sale since Thursday, September 1, 2016. 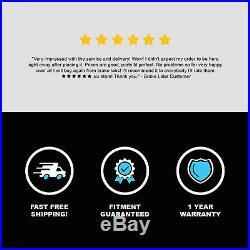 This item is in the category “eBay Motors\Parts & Accessories\Car & Truck Parts\Brakes & Brake Parts\Brake Component Packages”. 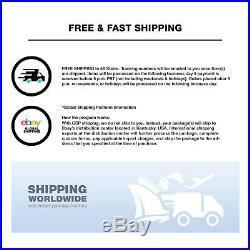 The seller is “brakelabs” and is located in La Habra, California. This item can be shipped to United States, all countries in Europe, all countries in continental Asia, Canada, Australia, Mexico, South africa, Bahamas, New Zealand, Brazil, Chile, Colombia, Costa rica, Panama, Trinidad and tobago, Guatemala, Honduras, Jamaica. 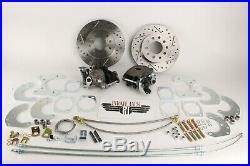 THIS IS A COMPLETE KIT TO CONVERT YOUR FULL SIZE FORD FROM DRUM BRAKES TO DISC BRAKES. YOU WILL RECEIVE WITH THIS KIT; This kit works with your stock drum brake spindle. 1 POWER BRAKE BOOSTER WITH FIREWALL BRACKETS AND CLEVIS ROD (8 inch dual diaphragm). 1 DUAL BOWL MASTER CYLINDER. 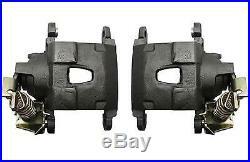 2 CALIPERS WITH semi metallic PADS AND MOUNTING BRACKETS. 2 RUBBER BRAKE HOSES. 1 PROPORTIONING VALVE WITH BRACKETS AND LINES. 2 ROTORS drilled and slotted with an anodized finish. ALL BEARINGS, SEALS, AND HARDWARE. THIS KIT REQUIRES 15 DISC BRAKE WHEELS. YOU WILL HAVE TO RE PLUMB YOUR EXISTING BRAKE LINES TO WORK WITH THE NEW PROPORTIONING VALVE OTHERWISE THERE IS NO MODIFICATIONS NEEDED. THIS KIT IS A DIRECT BOLT ON. The item “1957-1964 Galaxie Ford disc brake conversion new drilled slotted rotors” is in sale since Thursday, December 21, 2017. This item is in the category “eBay Motors\Parts & Accessories\Vintage Car & Truck Parts\Brakes”. The seller is “tomsclassic” and is located in Isanti, Minnesota. 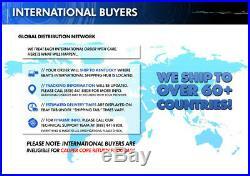 This item can be shipped to United States, Canada, United Kingdom, Denmark, Romania, Slovakia, Bulgaria, Czech republic, Finland, Hungary, Latvia, Lithuania, Malta, Estonia, Australia, Greece, Portugal, Cyprus, Slovenia, Japan, Sweden, South Korea, Indonesia, Taiwan, South africa, Thailand, Belgium, France, Hong Kong, Ireland, Netherlands, Poland, Spain, Italy, Germany, Austria, Bahamas, Mexico, New Zealand, Singapore, Switzerland, Norway, Saudi arabia, Ukraine, United arab emirates, Qatar, Kuwait, Bahrain, Croatia, Malaysia, Brazil, Chile, Colombia, Costa rica, Panama, Trinidad and tobago, Guatemala, Honduras, Jamaica, Viet nam. Ford F150 2004 – 2008 – 4WD 6 Lug Models ONLY (Will NOT fit 2WD Models) Lincoln Mark LT 2006 – 2008 – 4WD 6 Lug Models ONLY (Will NOT fit 2WD Models). 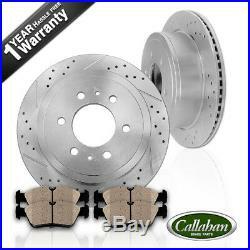 The item “Front Drill Slot Brake Rotors And Ceramic Pads For 2004 2008 Ford F150 Mark Lt” is in sale since Monday, April 20, 2015. This item is in the category “eBay Motors\Parts & Accessories\Car & Truck Parts\Brakes & Brake Parts\Brake Component Packages”. The seller is “brake_overstock” and is located in Orland Park, Illinois. This item can be shipped to United States, Canada, United Kingdom, Denmark, Romania, Slovakia, Bulgaria, Czech republic, Finland, Hungary, Latvia, Lithuania, Malta, Estonia, Australia, Greece, Portugal, Cyprus, Slovenia, Japan, China, Sweden, South Korea, Indonesia, Taiwan, South africa, Thailand, Belgium, France, Hong Kong, Ireland, Netherlands, Poland, Spain, Italy, Germany, Austria, Bahamas, Mexico, New Zealand, Philippines, Singapore, Switzerland, Norway, Saudi arabia, Ukraine, United arab emirates, Qatar, Kuwait, Bahrain, Croatia, Malaysia, Brazil, Chile, Colombia, Costa rica, Dominican republic, Panama, Trinidad and tobago, Guatemala, El salvador, Honduras, Jamaica, Viet nam. Ford Excursion 2000 – 2005 4WD Models Only Ford F-250 Manufactured 3/22/1999 – 2004 4WD Models Ford F-350 Manufactured 3/22/1999 – 2004 4WD Models with Single Rear Wheels. 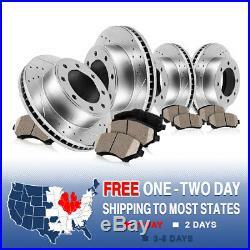 The item “Front+Rear Drill Slot Brake Rotors & Ceramic Pads For Ford Excursion F250 F350″ is in sale since Monday, June 8, 2015. This item is in the category “eBay Motors\Parts & Accessories\Car & Truck Parts\Brakes & Brake Parts\Brake Component Packages”. 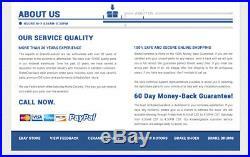 The seller is “brake_overstock” and is located in Orland Park, Illinois. This item can be shipped to United States, Canada, United Kingdom, Denmark, Romania, Slovakia, Bulgaria, Czech republic, Finland, Hungary, Latvia, Lithuania, Malta, Estonia, Australia, Greece, Portugal, Cyprus, Slovenia, Japan, China, Sweden, South Korea, Indonesia, Taiwan, South africa, Thailand, Belgium, France, Hong Kong, Ireland, Netherlands, Poland, Spain, Italy, Germany, Austria, Bahamas, Mexico, New Zealand, Philippines, Singapore, Switzerland, Norway, Saudi arabia, Ukraine, United arab emirates, Qatar, Kuwait, Bahrain, Croatia, Malaysia, Brazil, Chile, Colombia, Costa rica, Dominican republic, Panama, Trinidad and tobago, Guatemala, El salvador, Honduras, Jamaica, Viet nam. Proportioning / Combo Valves. Special Order Custom Builds. Mopar B & E Body. Mopar A Body 5×4.5. Mopar A Body 5×4. Disc/ Disc Disc/ Drum. 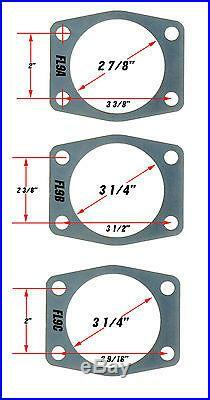 1957-81 F-100 F-150 Ford Truck Rear Disc Brake Kit Drilled/ Slotted Rotors. 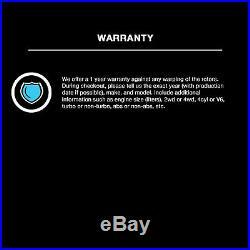 &###xA0;1957-81 Ford Truck Power Brake Booster Assembly. Ford 9Truck Kit. Rear Single Piston Calipers W/ E-Brake Option. Rubber Brake Hoses (Stainless Steel Available). E-Brake Rear Loaded Calipers. Brackets & Flanges to fit. Drilled 5×5.5 for 7/16 Studs. Pirate Jack Rear Ford 9 TRUCK Disc Brake Kit provides an easy to install, bolt on solution for upgrading your Pre-1987 Ford 9&###xE2;&###x20AC;&###x9D; rear-end light truck to disc brake performance. Many consumers may be unsure of which size 9&###xE2;&###x20AC;&###x9D; rear-end their vehicle has. Pirate Jack’s kit is unique in that it provides all the brackets and flanges that fit the three most popular sizes of the 9&###xE2;&###x20AC;&###x9D; rear end (3-3/8&###xE2;&###x20AC;&###x9D; x 2&###xE2;&###x20AC;&###x9D;, 3-1/2&###xE2;&###x20AC;&###x9D;x 2-3/8&###xE2;&###x20AC;&###x9D;, 3-9/16&###xE2;&###x20AC;&###x9D; x 2&###xE2;&###x20AC;&###x9D;). Top that off with 5 on 5 1/2 bolt pattern rotors and you eliminate much of the customer guess-work when purchasing and installing the kit. This kit does not come with a valve. If you are converting to Disc Brakes you will need a 4 wheels a disc/ disc valve (PV4) Adapters may be needed to adapt your lines to the master cylinder. This is common for conversions. Pirate Jack Hot Rod Restoration is your one-stop-shop for quality disc brake conversions, brake boosters, master cylinders, and proportioning valves. We specialize in performance brakes for late fullsize GM cars from 1955-70 and muscle cars from 1962-74, Mopar, Chevy, & Ford. Pirate Jack also carries a full line of parts for Street Rods & Custom Built cars, including pedal assemblies, and hard to find power boosters, GM Restoration Parts, disc brake kits, and suspension products. Check out our tech page for information like how to test a brake booster, how to hook up a proportioning valve, how to plumb my brake lines, how to test my master cylinder and a F. Q’s on how to calculate pedal ratio. We offer FREE tech support on all our disc brake kits and booster conversion kits to take the guess work out of your job. Pirate Jack offers how to guides and instructional videos on our video page. We strive to give you 100% satisfaction and we sincerely want to help you stop your vehicle and install our kits safely. We want your restoration to be easy! We also have some instructional video’s and other helpful support you may need. We give limited support on weekends and are available M-F 7:30-4:30 EST. Your order will be professionally and durably packed for its time in transit to you so we can give you the very best. In addition, you will receive a packing slip to check over your order. Add to Favorite Sellers. Sign up to Newsletter. View more great items. This listing is currently undergoing maintenance, we apologise for any inconvenience caused. 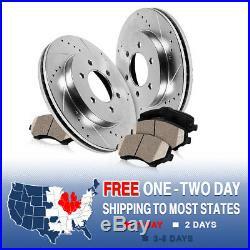 The item “1957-81 F-100 F-150 Ford Truck Rear Disc Brake Kit Drilled/ Slotted Rotors” is in sale since Friday, March 2, 2018. 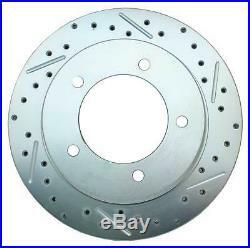 This item is in the category “eBay Motors\Parts & Accessories\Car & Truck Parts\Brakes & Brake Parts\Other”. The seller is “pirate-jack-asheville-nc” and is located in Asheville, North Carolina. This item can be shipped to United States, Canada, United Kingdom, Denmark, Romania, Slovakia, Bulgaria, Czech republic, Finland, Hungary, Latvia, Lithuania, Malta, Estonia, Australia, Greece, Portugal, Cyprus, Slovenia, Japan, China, Sweden, South Korea, Indonesia, Taiwan, South africa, Thailand, Belgium, France, Hong Kong, Ireland, Netherlands, Poland, Spain, Italy, Germany, Austria, Bahamas, Mexico, New Zealand, Singapore, Switzerland, Norway, Saudi arabia, Ukraine, United arab emirates, Qatar, Kuwait, Bahrain, Croatia, Malaysia, Brazil, Chile, Colombia, Costa rica, Panama, Trinidad and tobago, Guatemala, Honduras, Jamaica, Viet nam.